Marco Cecchinato's tennis racquet - what racquet does Cecchinato use? Marco Cecchinato played the match of the tournament at the French Open yesterday when he beat Novak Djokovic in four sets: 6-3 7-6 1-6 7-6 with an amazing tie-break. But what racquet does he use? This post deals with Marco Cecchinato’s tennis racquet. 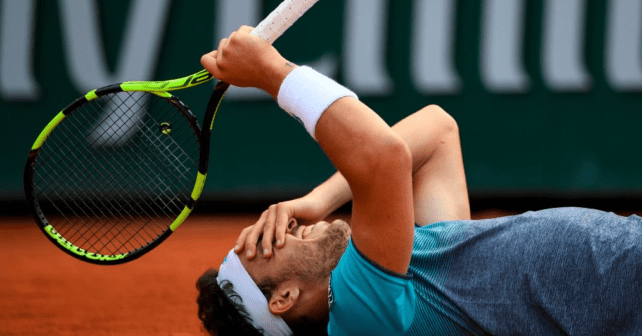 Marco Cecchinato has a game built for clay courts and he showed it at Roland Garros yesterday with a spectacular performance that was arguably the best match of the tournament. Especially the long fourth set tie-break where both players reached some kind of peak, was definitely a tennis fan’s delight. Just think of how different Cecchinato’s career is now compared to the match-fixing allegations he faced in 2016! After the allegations were overturned (rightly or wrongly, is hard to say – just read this New York Times article), he has won an ATP tournament in Budapest and now reached the semi-finals in a grand slam. But what is Marco Cecchinato’s tennis racquet? Marco Cecchinato endorses the Babolat Pure Aero VS Tour , but is playing with an older Babolat Aero Storm GT strung with Babolat RPM Blast 16 strings . The old Aero Storm line has been quite popular with pro players since it offers a good blend of control and spin (more control than the Pure Aero ), but players below that level usually find the racquets harsh on the arm. I personally have play-tested a few different versions of the Aero Storm and although I appreciate some of its strengths, the stiffness has always bothered me. 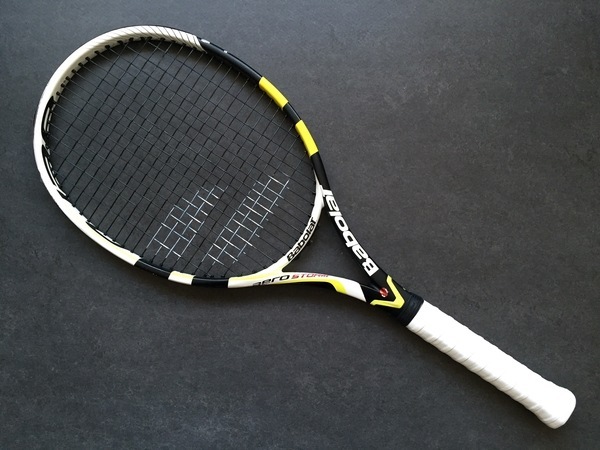 The Babolat Aero Storm GT is a discontinued racquet, but you find similar feel with the Pure Aero VS or VS Tour. 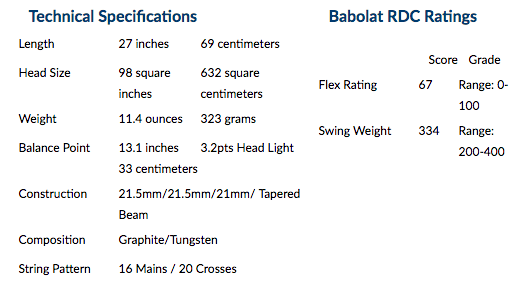 There is also a Babolat Pure Aero VS Stars and Stripes edition that Jack Sock (read about his racquet here) used to endorse. I can not really recommend these racquets as I do not like them myself, but if you string them really low (at around 18 kg), I have heard they play more comfortably, so might be worth a try if you have no arm issues whatsoever! What I sadly do not know about Marco Cecchinato’s tennis racquet is what kind of specs and customizations or even string tension he uses. I hope you, dear readers, can help out here! Any tip is greatly appreciated! What do you think of Marco Cecchinato and his game? Please comment below! Unstrung weight 326gr, balance point 30,7 millimetri, stiffness 70RA,Grip size L3. Babolat RPM Blast, 1,25mm and 22/21 kg tension. Grazie Mirko! Where did you find this out? Will post it. For the racquet spec. I read just this month on “TennisItaliano” the Italian most widely read magazine about tennis.